I think I can officially declare that I have a favorite indie brand. My favorite indie brand is Once Upon a Polish. I love the originality of her polishes. The formulation on her polishes is superb. I think this is one of the reasons her polishes stand out to me. Her polishes are glitter bombs, and these apply so smoothly and easily. They are not clumpy at all. The other thing I really like Once Upon a Polish is Kimberly the creator. She is very kind, and answers questions/requests quickly.. I am all about service, when a seller goes out of their way to make a customer feel appreciated it means a lot! This is a polish I bought from her shop recently. Dragon Spit is a mix of holographic red,purple, blue, and orange small and large hex glitters and bar glitters in a clear base. This polish is awesome! I love the color combination, and it definitely makes me think "dragon spit". It looks fiery! I'm not typically a bar glitter gal, but I think this works well with this polish. I think without it, the polish would definitely be incomplete. What I also like is you're not fishing for glitter at all. This just 2 coats of the polish, but with one you'll get great coverage. I wouldn't try to wear this alone, but for layering it's perfect. It gives a great effect! 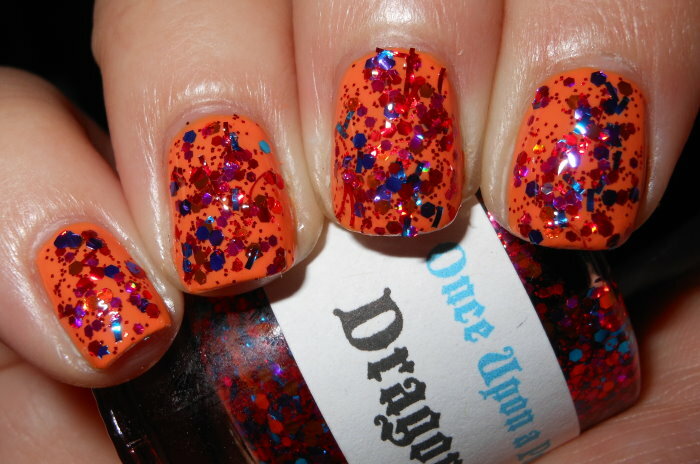 Dragon Spit is not currently available, but Kimberly is good about restocking her polishes in a timely manner. She still has some other polishes available on her etsy shop. You should check out her Facebook page too where she updates everyone on her restocks. Whoa, that is one awesome glitter! I love everything about this! The name, the glitter, the combo! Gorgeous! I love this! It's a gorgeous glitter. I'll have to check out her shop. I love me anything that is fairy tale themed. Love the effect it gives! This is a stuning glitter combo!! nice to hear about good service in the indie world.. so many odd things happening there! Oh this is a nice one. I don't own any Once Upon a Polish lacquers but I will have to check out her shop in the future.